Hops are in huge demand these days and Colorado farmers are embracing this popular cash crop and are starting to plant more and more acreage every year. With each new acre planted, Colorado is slowly becoming known not only for their craft beers, but also as a great place to grow the main bittering ingredient for those brews. Five years ago in 2007, a big hop shortage hit the USA and drove hop prices up over 400% for many varieties for the better part of a year or more. The difficulty in getting some of the more popular hops drove many to plant hops in their own fields to help offset possible shortages in the future. Now while Colorado is far behind the acreage planted in the Pacific Northwest states of Washington, Oregon and Idaho, it is starting to fit into the top 5 producers in the USA. Colorado now has over 20+ hop farms scattered across the state, most of which only started up in the last 4 years. 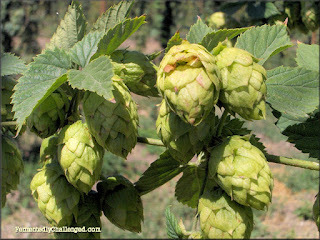 Some of the biggest and best hop fields are located in the foothills and western slope area of the state. Some of the biggest hoppin' towns in Colorado are: Palisade, Olathe, and Hotchkiss. In August 2011, only 75 acres of hops were planted and harvested in Colorado - not including personal gardens from homeowners. That accounted for around 150,000 pounds of hops. A typical hop yield is roughly 2,000 pounds per acre and 1,100 plants per acre. Hop plants can grow up to around 20' tall and are typically grown around twine attached to trellises. Hops are also know to grow wild in the mountains of Colorado. This year's acreage is expected to be much bigger. This year several more hop farms have sprouted up. It normally takes a hop plant 3 years to become fully mature and produce the most hop blossoms possible. So some of these newer hop farms won't see full production for a couple more years. Recently, Colorado hop farmers started getting together and with the help of Ali Hamm, who's worked through Colorado State University and now Summit Plant Labs, started up the Colorado Hop Growers Association in an effort to help promote the burgeoning hop industry in the state. Colorado hop growers are working closely with Colorado craft breweries to help meet some of the growing demand for hops. Over 3 dozen or more varieties of hops are grown in the state including: Brewer's Gold, Calicross, Cascade, Centennial, Challenger, Chinook, Columbus, Cluster, Crystal, Fuggle (US), Galena, Glacier, Hallertauer (US), Horizon, Kent Golding (UK), Liberty, Magnum, Mt. Hood, Newport, Northern Brewer, Nugget, Perle (US), Pride of Ringwood, Red Vine, Saaz (US), Sanitiam, Spalt Select (US),Sterling, Sunbeam, Tettnanger (US), Ultra, Vojvodina, Willamette, Wye Viking, and Zeus. (All of these varieties are grown at High Hops in Windsor for example). The total number of commercial growers doesn't come close to counting all of the homegrown hop gardens that individuals, homebrewers and selected breweries are growing locally for personal use. Some gardeners plant hops not for beer but for looks. Hops make great looking garden vines. Many home owners are growing hops specifically for specific brewery projects. Breweries like AC Golden, Odell Brewing and Denver Beer Company often look to their fans for helping them grow hops for special harvest fresh hop brews that are made in August and September. You might even be surprised to know that hops grow in the wild here in Colorado too. Next time you hike your favorite trail in Colorado in July or August, check around, you might just see some growing wild near you. 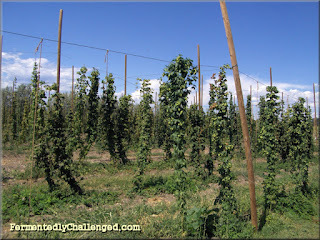 So where are all the hop farms in Colorado? Continue reading for a list of some of the best known hop farms in Colorado.